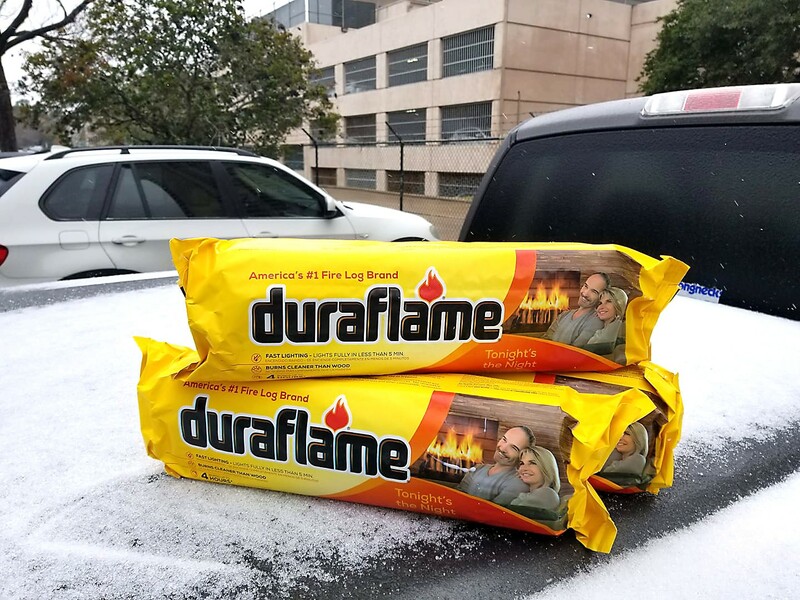 Many Houston restaurants are closed today, January 16, due to freezing, wet roads. Photo via PxHere. A lot of moisture and below-freezing temperatures are conspiring for icy road conditions today. In light of that, some Houston bars and restaurants are staying closed to help keep employees and patrons safe. This list will be updated continually as we are rapidly receiving new information. If you don’t see a place on our list—actually, even if you do—we strongly recommend you call ahead before venturing out to verify it is open! Decisions to close have been happening quickly today. Click here to jump to the list of open bars and restaurants. This article had its final updates at 7:37 p.m. on 1/16/2017. Antone’s Famous Po’ Boys: All locations, including the storefronts at 4520 San Felipe and 2724 West TC Jester as well as the Greenway Plaza and downtown kiosks are closed today. Arnaldo Richards’ Picos, 3601 Kirby: The Upper Kirby Mexican restaurant closed at 7 p.m. per a representative. Arturo Boada Cuisine, 6510 Del Monte: The chef-owned restaurant is closed for dinner but hopes are that it will resume normal hours tomorrow. Balls Out Burger, 1603 North Durham: Expectations were that the burger joint with the saucy name would be open, but it was decided it would be best to close up shop around 4:30 p.m.
Benjy’s In The Village, 2424 Dunstan: The Rice Village restaurant decided to close for the rest of the day. Bistro Provence, 13616 Memorial: Owner Genevieve Guy is keeping the restaurant closed today due to the weather. Brasserie du Parc, 1440 Lamar: Chef Philippe Verpiand’s downtown French restaurant is closed today. Brennan’s of Houston, 3300 Smith: Owner Alex Brennan-Martin says circumstances have compelled the Houston Creole classic to not be open for dinner. Cafe Annie, 1800 Post Oak: Chef Robert Del Grande’s Galleria-area restaurant is closed this evening. Christian’s Tailgate, multiple locations: According to general manager Chaise Dykes of the White Oak location, all locations are closed today. Coltivare, 3320 White Oak: Chef Ryan Pera’s restaurant is closed today—because it’s always closed on Tuesdays. 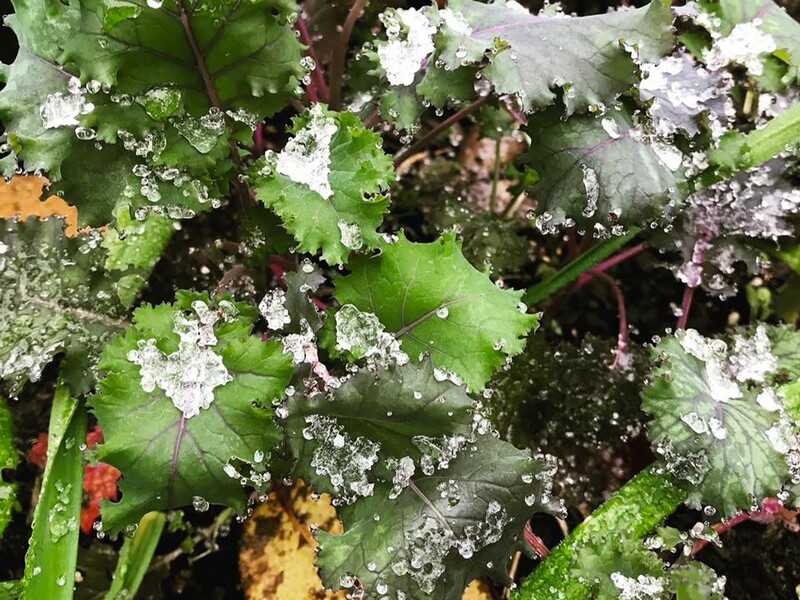 Ice crystals on leaves in Houston the morning of January 16, 2017. Photo by Christi Martinez. Craft Burger Truck: Chef and owner Shannen Tune reports that the truck is not venturing out today and the scheduled events are canceled. Dish Society: All locations are now closed for the rest of the day. D’Amico’s Italian Market Café, 510 Morningside: It closed early today at 2:30 p.m.
Frank’s Americana Revival, 3736 Westheimer: Owner Michael Shine says the restaurant will be closed at lunch today. Fratelli’s Italian Restaurant, 1330 Wirt: According to chef Mark Cox, the restaurant is closed this evening. Goode Company (various locations): All Goode Company restaurants are closing at 3 p.m. today. Goode Company Taqueria will reopen tomorrow at 11 a.m. The Hay Merchant, 1100 Westheimer: Kevin Floyd’s extensive beer (and cocktail) bar isn’t opening tonight. Helen Greek Food & Wine, 2429 Rice and Helen In The Heights, 1111 Studewood: Director of operations Tim Faiola says the decision has been made to close at 3 p.m.
Heights Bier Garten, 1433 North Shepherd: Co-owner Steven Salazar says the popular beer spot will be closed tonight. Habanera & The Guero, 9902 Gulf Freeway: Owner Vanessa Lomeli has decided to close the Tex-Mex favorite for tonight. Harold’s Restaurant & Tap Room, 350 West 19th: Owner Alli Jarrett reports her Heights restaurant opened for lunch but is closed for dinner. Hughie’s, 1802 West 18th and 4721 North Main: We’ve been informed that both locations closed at 6 p.m.
Jonathan’s The Rub, 9061 Gaylord: The restaurant is closed for dinner tonight. Kata Robata, 3600 Kirby: Chef Manabu Horiuchi’s modern Japanese dishes will sadly not be available tonight, as the restaurant is closed for dinner. Kenny & Ziggy’s, 2327 Post Oak and 5172 Buffalo Speedway: Both locations are closed but—weather permitting—will reopen at 7 a.m. tomorrow. Lei Low, 6412 North Main: The photo below pretty much says it all. Liberty Kitchen: All Liberty Kitchen locations are closed except for Liberty Kitchen & Oyster Bar in the Heights. 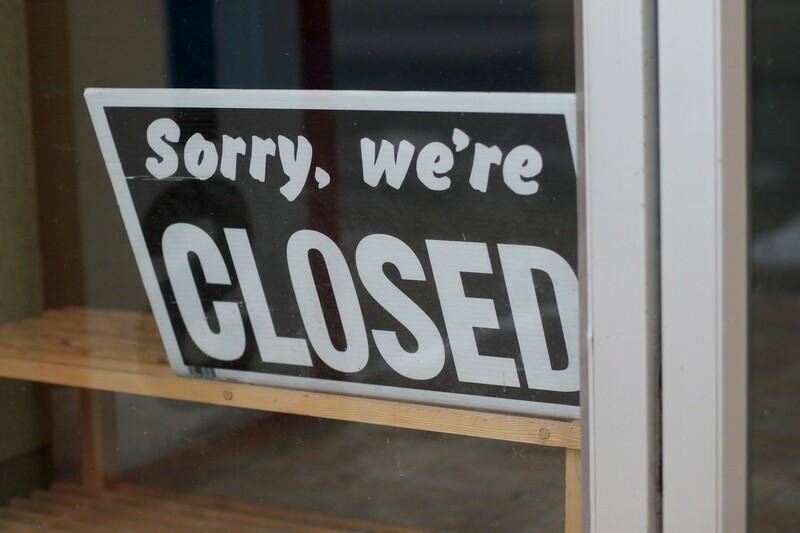 Local Foods: All locations are closed. Max’s Wine Dive, 214 Fairview and 4720 Washington Avenue: Both locations of the casual, wine-driven restaurant are closed for dinner. Molina’s Cantina, 3801 Bellaire and 7901 Westheimer: Both locations closed early today at 3 p.m.
Nancy’s Hustle, 2704 Polk: Owner Sean Jensen says the decision has been made to not open this evening. 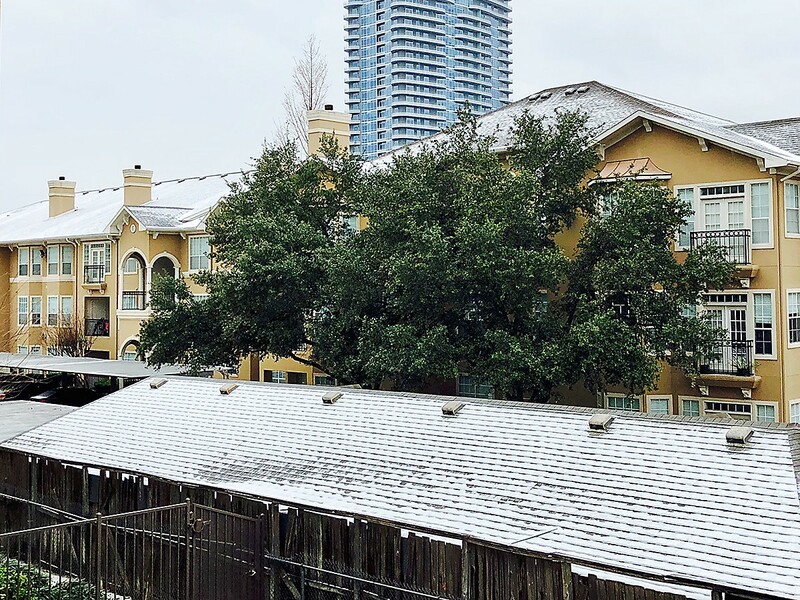 Something Houstonians don’t see often: snowy rooftops. Photo by Beth Levine. Ninja Ramen, 4219 Washington: Owner Christopher Huang decided to stay closed for dinner and late-night service. One Armed Scissor, 4721 North Main: Co-owner Michael Molina says the bar is closed tonight. One Fifth Romance Languages, 1658 Westheimer: Chris Shepherd’s annually changing eatery will not open for dinner tonight. Ooh La La Dessert Boutique: All locations of the popular pastry places are closed today. Pax Americana, 4319 Montrose: Executive chef Martha de Leon says it’s closed tonight but will reopen as usual tomorrow. Picnic Box Lunches, 1928 Bissonnet: It closed early today at 3 p.m.
Pokeology, 5555 Morningside: Owner Jason Liao says his poke shop, located within Doc Holliday’s bar in Rice Village, isn’t opening today. “Anyone got a match?” Photo by Jonathan Jones. Presidio, 911 W 11th: Executive chef-owner Adam Dorris says the restaurant is closed today. Public Services Wine & Whisky, 202 Travis: No services tonight of the liquid kind tonight; owner Justin Vann says the bar will be closed. Rainbow Lodge, 2011 Ella: Beverage director Marc Borel says general manager Tim Neely has decided the restaurant will be closed today due to safety concerns. Raven Grill, 1916 Bissonnet: The restaurant opened at its regular time, but it closed at 3 p.m.
Raven Tower: The music and bar venue is closed today. Retrospect Coffee Bar, 3709 La Branch: Isabel Protomartir emailed to report that it is closed today. Revival Market, 550 Heights: Get a hot lunch and any needed grocery items now if you can get there safely; it’s closing at 1 p.m. today. Roegels Barbecue Co., 2223 South Voss: Was open for lunch today but closed at 1:30 p.m. Owner Russell Roegels expects to be open regular business hours on Thursday. 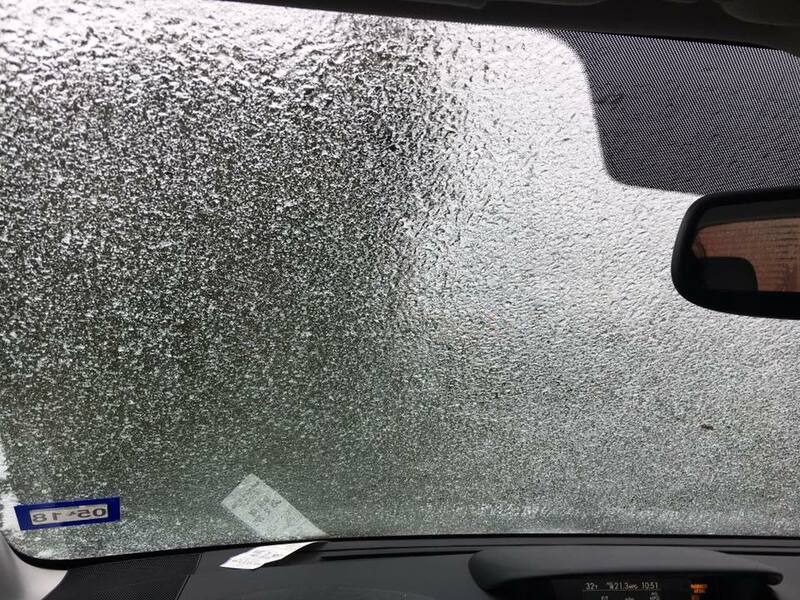 Melange Creperie owner Tish Ochoa sent in this photo of her windshield covered with a thick layer of ice. Photo by Tish Ochoa. Roka Akor, 2929 Weslayan: Restaurant management decided to close for dinner. Plans are to resume regular hours tomorrow. Roost, 1972 Fairview: Chef-owner Kevin Naderi says his Montrose restaurant isn’t open tonight, but should be open regular hours tomorrow. Saint Arnold Brewing Company, 2000 Lyons: The kitchen and beer hall are closed today per the company’s Facebook feed. Sam’s Boat, 5720 Richmond: Owner Jeff Inman emailed to say it is open for business with freshly made soups and plenty of hot and spicy boiled crawfish. Updated 1/16/18, 2:34 p.m.: Inman now says the CEO has decided all Sam’s Boat locations are closing, except for Seabrook which is open until 10 p.m.
SeaSide Poke, 2118 Lamar: You’ll have to wait for a fresh fish fix from here—it’s closed today. Sonoma Wine Bar, 801 Studewood and 2720 Richmond: Owner Farrah Cauley says both locations are closed. State Of Grace, 3258 Westheimer: Chef Bobby Matos says the River Oaks restaurant is closed for both lunch and dinner. Steak 48, 4444 Westheimer: Nothing’s grilling at the River Oaks steakhouse tonight. Tacos A Go Go: All locations are closing at 3 p.m. The Tasting Room, 1101 Uptown Park and 818 Town & Country: Both locations are closed this evening. Updated 1/16/17, 4:51 p.m.: A representative now says that the The Tasting Room CityCentre location on Town & Country is open. Plans are to serve until midnight. Treebeards, multiple locations: All of the downtown comfort food mainstays are closed. Underbelly, 1100 Westheimer: Chef Chris Shepherd’s original restaurant closed at 3 p.m. today. Worcester’s Annex, 1433 North Shepherd: Co-owner Steven Salazar says the bar will be closed tonight. Yauatcha, 5045 Westheimer: The elegant Galleria restaurant closed after lunch service. 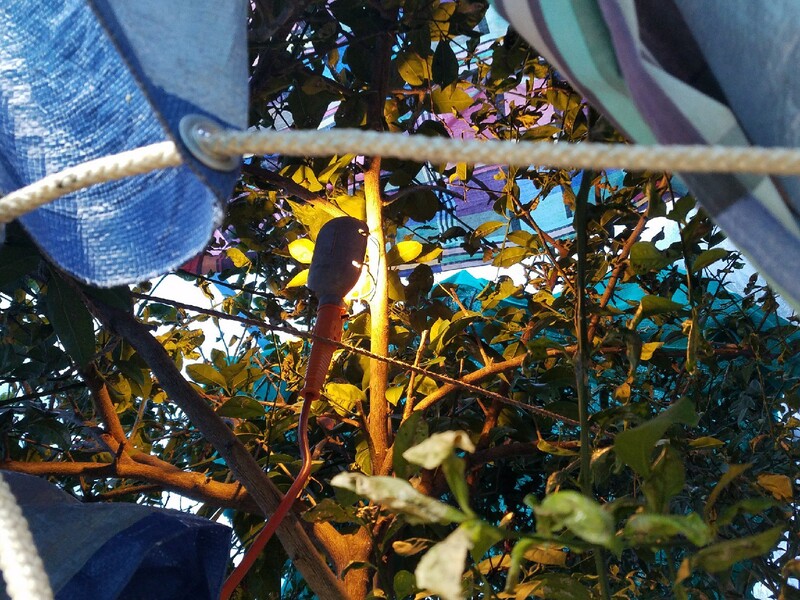 Food writer, photographer and publicist assistant Dragana Harris outfitted her Meyer lemon tree with a worklight in the hopes of keeping it from freezing. Photo by Dragana Harris. The Barking Pig, 2307 Ella: Owner Kristen Powell says the casual Heights eatery and bar is open tonight. Bayou & Bottle and Quattro at The Four Seasons, 1300 Lamar: Both the upscale downstairs bar and upstairs restaurant at the downtown hotel are open. Bollo Woodfired Pizza, 2202 West Alabama: Owner Ray Salti says the wood-fired ovens are up and running at his pizza eatery. BuffBurger, 1014 Wirt: Owner Sara Morris Burden reports the West side gourmet burger spot is open today. The Burger Joint, 2703 Montrose: If you’re in the Montrose and in need of a hot, tasty burger (who isn’t? ), this is where to go. Cuchara, 214 Fairview: Owner Charlie McDaniel reports that Mexico City-inspired Cuchara is open as usual this evening. Eight Row Flint, 1039 Yale: If you’re able to get there safely, a little whiskey will help take the chill off. It’s open from 2 p.m. to midnight. Field & Tides, 705 East 11th: Chef-owner Travis Lenig says it is open for dinner, but he’s “playing it by ear.” So, if you are nearby, have dinner sooner rather than later. Goodnight Charlie’s, 2531 Kuester: The Montrose honky tonk just off Westheimer is open regular hours, from 4 p.m. to 2 a.m.
Griff’s, 3416 Roseland: A reader reports Griff’s is open and offering steak night as usual. Get a 16-ounce T-bone, baked potato and draft beer for $12.99. Well drinks are $3.25 after 9 p.m. The Halal Guys, 3821 Farnham: Get a gyro platter if it’s safe to do so; the Upper Kirby location is open until 8 p.m.
King’s Biergarten, 1329 East Broadway, Pearland and King’s Bierhaus, 2044 East T C Jester: Both German-style beer houses are not only open, but are offering free, warm Gluhwein (mulled wine) to every customer. Liberty Kitchen: Liberty Kitchen & Oyster Bar open in the Heights is open. The other Liberty Kitchen locations are closed. Maple Leaf Pub, 514 Elgin: Owner Olivia Marie lives nearby; therefore the pub is open with cold beer, burgers and buffalo chicken sandwiches. Muldoon’s The Patio, 2611 Augusta: We’ve been told it’s open “until it is no longer safe”! We’re working on getting specifics. Pistolero’s, 1517 Westheimer: Reported as open by a reader just after 4 p.m. today. A representative says it is $1 Taco Tuesday as usual, too. Pondicheri, 2800 Kirby: The bake shop upstairs is closed, but the downstairs restaurant is offering counter service from 5 to 8 p.m. this evening. Ramen Tatsu-ya, 1722 California: Reported as open as of 4:09 p.m. by a reader. Updated 1/16/17, 4:25 p.m.: A representative confirms that plans are to be open this evening. Ristorante Cavour at Hotel Granduca, 1080 Uptown Park: A representative says plans are to be open this evening. Tango & Malbec, 2800 Sage: Good news: if you’re in the Galleria area and have a hankering for steak and red wine, Tango & Malbec is ready to serve. The Tasting Room, 818 Town & Country: This CityCentre location is open. Plans are to serve until midnight. Note that the Uptown Park location is closed. Willie G’s, 1640 West Loop South: According to general manager Keith Thompson, the restaurant is open until 8 p.m.